Should I buy a house or continue staying on rent? This is one of the most important questions an individual in India has to answer in his/her life. Therefore, it is important to evaluate your situation before answering this question. Raghu is an architect who has been living and working in the city for the past few years. Until now, Raghu had been staying on rent; however, with his parents wanting him to get married, he is confused whether he should continue to live on rent after getting married or should he purchase a new house. This is one of the most important questions an individual in India has to answer in his/her life. It is also a very confusing question as we are enticed with the thought of owning a house, while, at the same time, scared of paying huge amounts in EMI. Staying on rent has its upsides as we don’t need to pay any EMIs and can change accommodations as and when required. A house, on the other hand, is an investment that will stay until otherwise. Let us try to clear some things before attempting to answer this doubt. If you give a person the option to buy a flat in a metropolitan city where he is only residing due to work reasons and expect him to take it up without fail, then you'll be wrong. It doesn’t make sense for such a person to buy a flat and get stuck with 25 years worth of EMIs. Before buying a house, it is prudent to consider certain factors like your cash flow, career growth possibility, surplus income, etc. This is because it is easier to rent and you'll also pay lesser compared to a house loan EMI. Moreover, if the house is your own, then there is the problem of furnishing and paying maintenance as well as other municipal fees. Also, despite the high variety of home loans available, bankers sanction only 80-90% of the amount, which means that the buyer has to come up with 10-20% of the amount. This would be difficult given his/her fixed salary. It is advisable to buy a house in your youth rather than at a later age. This is because responsibilities increase with an increase in age, which takes a good chunk out of your salary. The mobility factor should also be considered. If the job is steady and does not involve moving around often, then it would be a good decision to buy a home, but not so good if the concerned individual has frequent transfers. There is never a "right time" to buy a home as it all depends on the buyer and his/her budget and requirements. A buyer has to weigh the pros and cons, affordability, and career growth before taking such a big decision. Renting a home, on the other hand, is a much simpler and easy option. 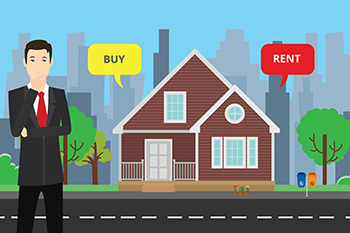 Both buying or renting a home has its own benefits and its share of problems. Therefore, it is important to evaluate your situation before making a decision.